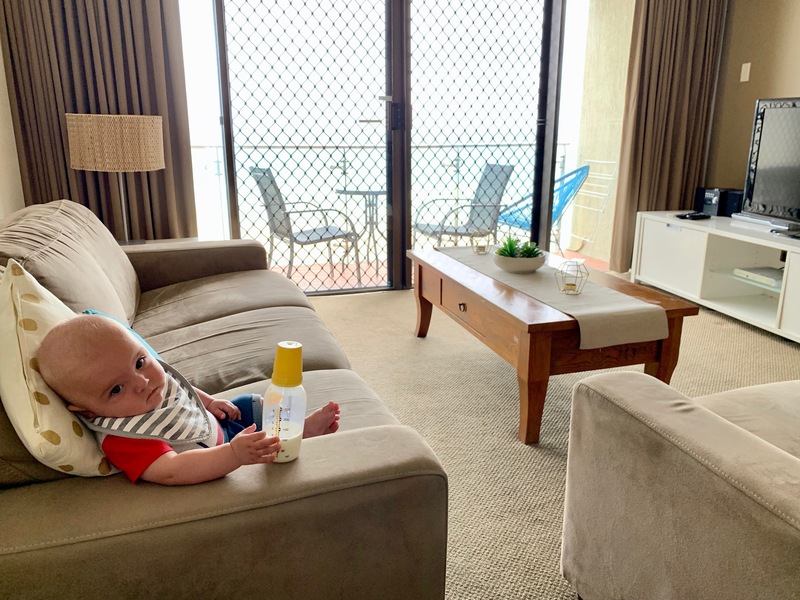 Travelling with a baby is something that is very new to us! After having a rough start to parenthood, this was our second small getaway since our boys were born. 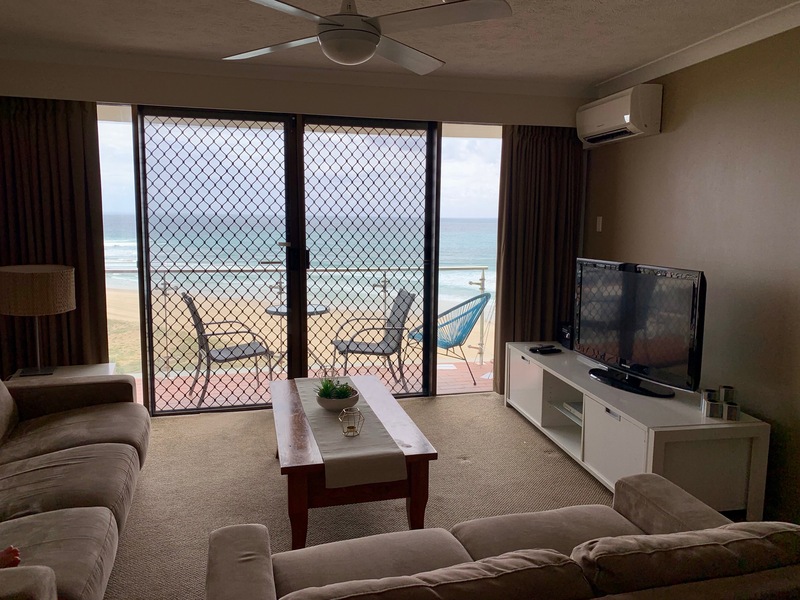 Nestled in between Burleigh Heads and Currumbin on the southern end of the Gold Coast, Palm Beach has a lot to offer. We enjoyed our family escape to Palm Beach. 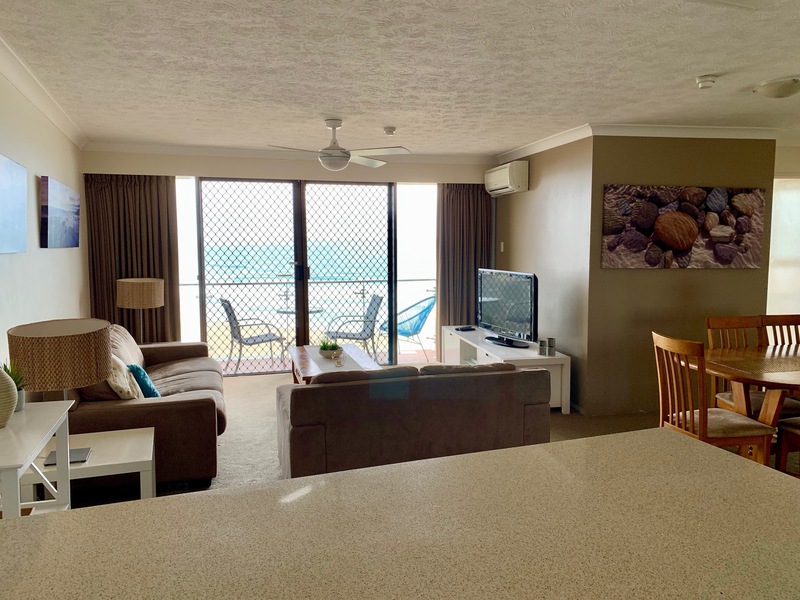 It is only a 15-minute drive from Coolangatta (Gold Coast) Airport, which makes a taxi or uber affordable, rather than trekking the 40-minute drive to Surfers Paradise. However, I would recommend hiring a car so you have one to explore the coast while you’re here! There are plenty of things to do around Palm Beach that are family friendly. This spot is very popular with locals and tourists and is very family friendly and FREE. You can drive and park right next to the rock pools so the walk is minimal. Click here to find out more. What a stunning walk! The main walking path is family friendly, although not pram friendly, so best wear a baby carrier if your little one can’t walk. The views are spectacular! Click here to find out more. If you’re looking for somewhere nice to grab a bite to eat before or after your walk, check out Burleigh Pavillion. It’s beautifully done and overlooks the ocean. Prices are as you would expect from an establishment like this! One of my favourite spots to visit. I pretty much grew up here as a kid, every year we would stay for a few weeks! It is often quiet and has a very relaxed feel to the area. The surf is usually really good too if you like to get on the surfboard. Click here to read more and see our tips. If you fancy a drive up to Surfers Paradise to see what all the fuss is about, it’s not a bad drive. There are nice boardwalks along the beach so you can easily take the family for a nice stroll. I personally think it’s too crowded at Surfers, but if you’re visiting the Gold Coast for the first time, it’s probably worth a look! Click here to read more. We visited at the back end of cyclone Oma was along the coast so I am sure it is quite different under different circumstances! Steep narrow stairs to get to the top – not small child friendly. View was okay, so if oyure stuck for time I wouldn’t worry about it! We stayed at Princess Palm on the Beach. 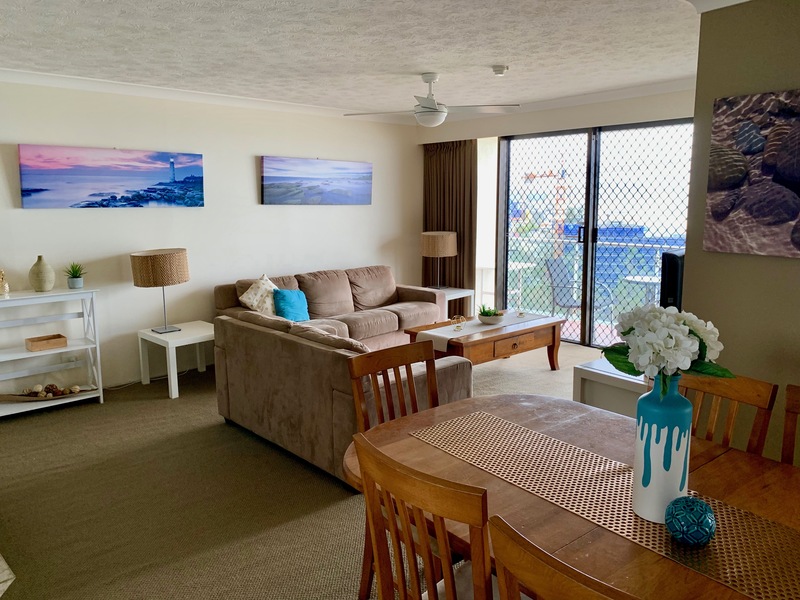 It is literally right on the beach with direct beach access. 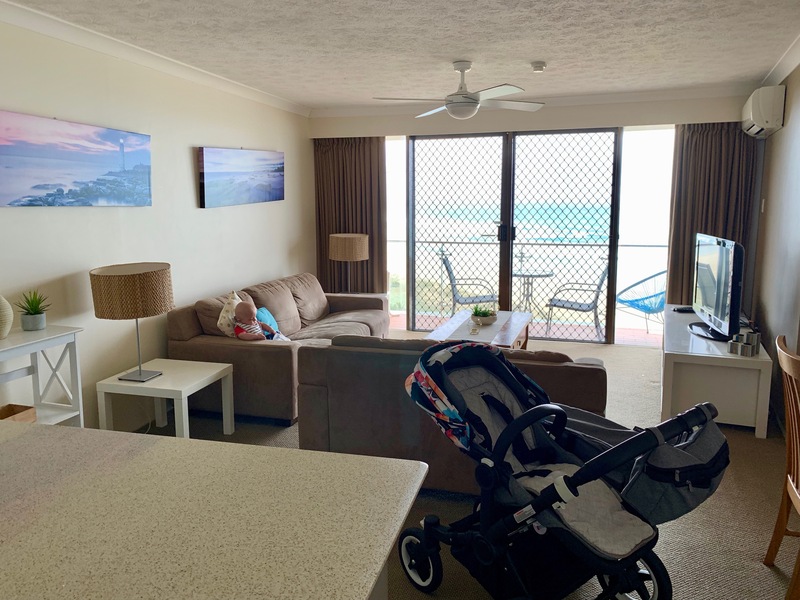 We had average weather during our stay which meant a day at the beach wasn’t possible, at least not with a baby, but the uninterrupted views of the ocean and Surfers Paradise meant that we didn’t feel stuck inside with nothing to see or do. 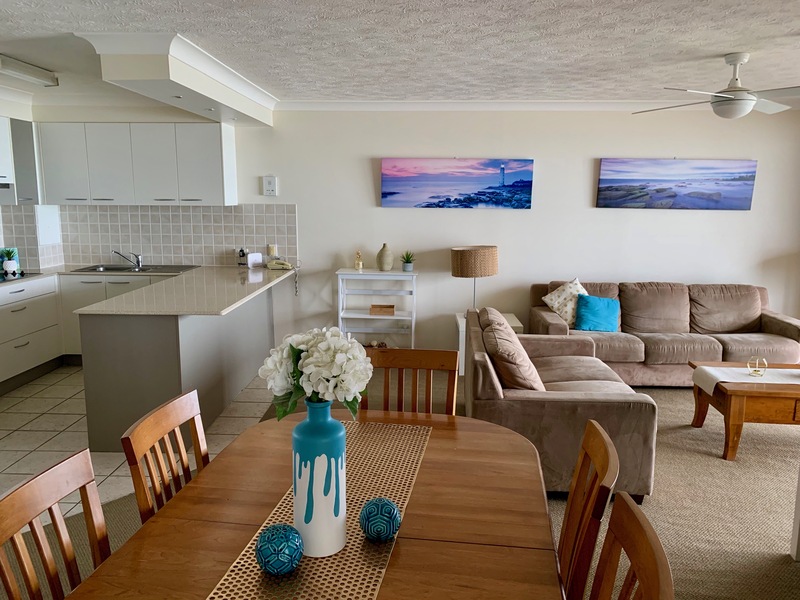 We had a self-contained 2 bedroom apartment, 2 bathrooms, full kitchen and internal laundry facilities within the second bathroom. Perfect for a getaway with children. 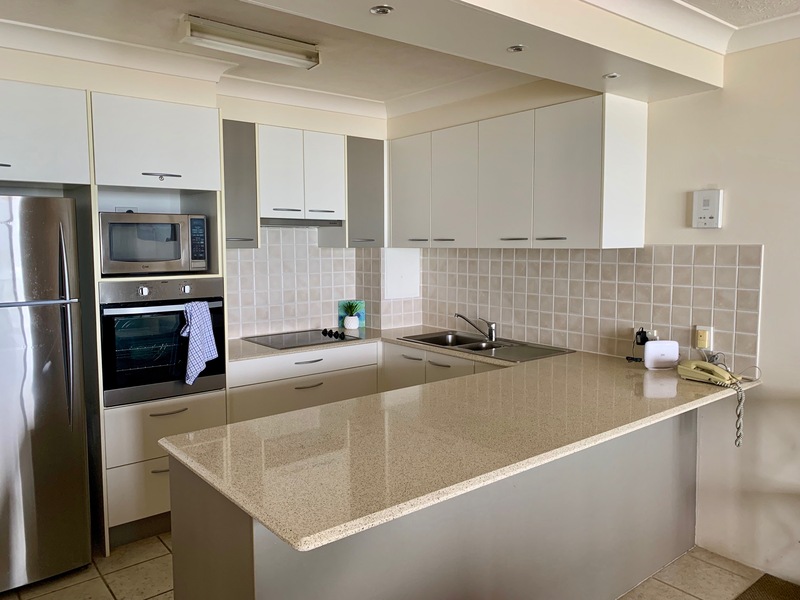 The complex also has a pool, tennis court and putt-putt outside as well as a games room with table tennis, pinball, board games and other games as well as a gym, for those who like to stay active while on holidays. There is a Coles supermarket 500m down the road so you can pick up some groceries. Next to coles is a bottle-o so you can also grab some drinks to enjoy on your balcony! Palm Beach Surf Club is a 1.3km stroll down the road. You can get there either by the beach or by road. The views are lovely and the meals are quite tasty as well. Tip: If you join as a member you will get discounts on your meals and likely make your money back within the first or second visit!